The 2-Hour Job Search shows job seekers how to work smarter (and faster) to secure first interviews. 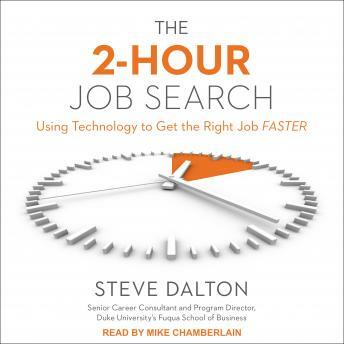 Through a prescriptive approach, Steve Dalton explains how to wade through the Internet's sea of information and create a job search system that relies on mainstream technology such as Excel, Google, LinkedIn, and alumni databases to create a list of target employers, contact them, and then secure an interview-with only two hours of effort. Avoiding vague tips like 'leverage your contacts,' Dalton tells job hunters exactly what to do and how to do it. This empowering book focuses on the critical middle phase of the job search and helps listeners bring organization to what is all too often an ineffectual and frustrating process.